Robotic-assisted surgery uses special surgical robotic arms that are controlled by the surgeon to perform very complex aspects of surgery so patients can enjoy better outcomes. The team at Gresham Women's Healthcare is skilled in robotic-assisted surgery, relying on the state-of-the-art da Vinci® surgical robotic system to perform very complex surgeries with the highest degree of precision possible. Minimally-invasive procedures that use robotic-assisted techniques are associated with faster healing and less post-op discomfort, as well as a significantly decreased risk of complications. Robotic surgery — or robotic-assisted surgery — uses specially designed surgical robotic arms to assist the surgeon during certain types of procedures, including minimally-invasive procedures. In a robotic-assisted surgical procedure, surgery is performed by the doctor using at a computer console controlling a surgical robotic arm. Where successful surgery requires movement abilities beyond that of the human hand, robotic-assisted surgery provides that high degree of precision needed. Robotic surgical procedures can be performed using very small incisions, resulting in less tissue damage and a faster and more comfortable recovery. What is the da Vinci surgical robot system? The da Vinci surgical robotic system is a state-of-the-art system used for many types of surgical procedures, including gynecological procedures. 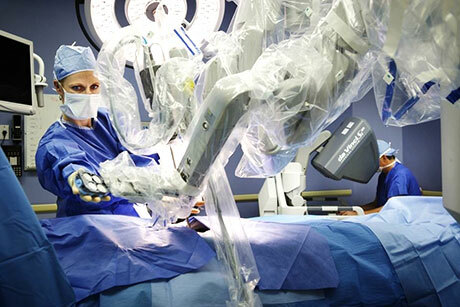 The robotic system uses a special computer-controlled arm that’s designed to be used through small incisions, as well as a high-definition video system for capturing detailed, magnified images of the surgical site that can be viewed on a special monitor. The da Vinci surgical robotic system has great flexibility and rotational movements, making it easier to perform very complex aspects of surgical procedures for greater precision, enhanced dexterity, increased predictability, and optimal results. What types of gynecological issues can be treated with robot-assisted surgery? Will a surgical robotic system be used for my surgery? Robotic-assisted surgery has resulted in superior outcomes for patients undergoing many types of surgical procedures, but it’s not always an ideal choice. The decisions of whether or not to use a surgical robotic system will be made on a case-by-case basis after the doctor performs a comprehensive evaluation of the patient, including diagnostic exams, and a review of the patient’s medical history.